6 to 10 days from US to you. Enjoy deeply reduced prices on these beautiful products that may contain a cosmetic impairment such as a slight nick, dent, chip, a repairable break, or have a scratch/peeling on the surface primer. All repairs to damaged products can be made using items used in the installation of the product (glue, putty, filler, sanding, etc.). The strength, functionality, craftsmanship and integrity of these products are guaranteed. Our blemished products can be restored to perfect condition using the same caulk, putty, sanding, or touch up paint our customers (even the do-it yourselfer) apply during installation. Lowest Price GuaranteeFound it for less? We offer not only the largest selection, but the best price match guarantee available. Simply enter the competitor link below, complete your order, and save! Custom Product This item is a custom item. Returns are not accepted. View in Catalog View this item in our catalog. Request a Custom Option Need something custom? We can help. Line Drawings Product Line Drawings. View online or print for offline use. Order a Material Sample for $9.99 Get familiar with Urethane. Order a sample today. Installation Instructions Get step by step installation instructions. View online or print for offline use. Material: Urethane Click here to learn more about Urethane. Architectural Specifications Get the complete architectural specifications sheet here. View online or print for offline use. Warranty Information Download manufacturers warranty information. 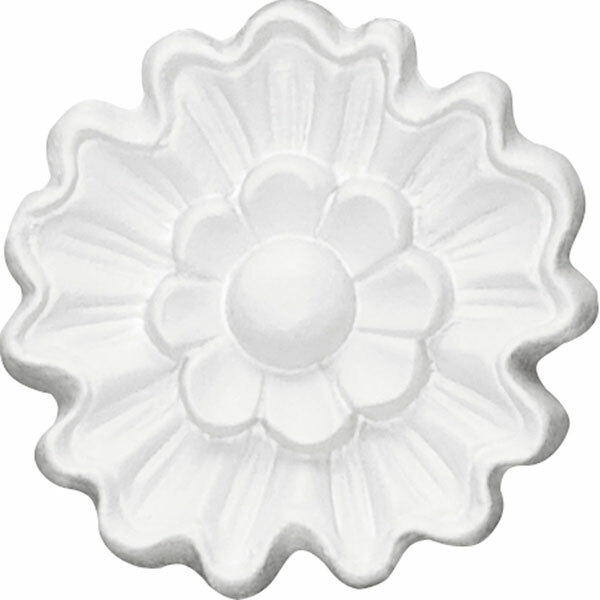 Our rosettes are the perfect accent pieces to cabinetry, furniture, fireplace mantels, ceilings, and more. Each pattern is carefully crafted after traditional and historical designs. Each piece comes factory primed and ready for your paint. They can install simply with traditional adhesives and finishing nails.